Protein targets to determine potential lead compounds for that target. Drugs to determine potential off-targets for which that drug might be associated. Disease pathways to determine lead compounds to modulate druggable targets in a disease of interest. Plus many useful features to facilitate analysis such as downloadable spreadsheets and knowledge graphs. To go directly to CarlsbadOne, please click HERE !!! To learn more about the entire CARLSBAD platform including CarlsbadOne, please click the image below. 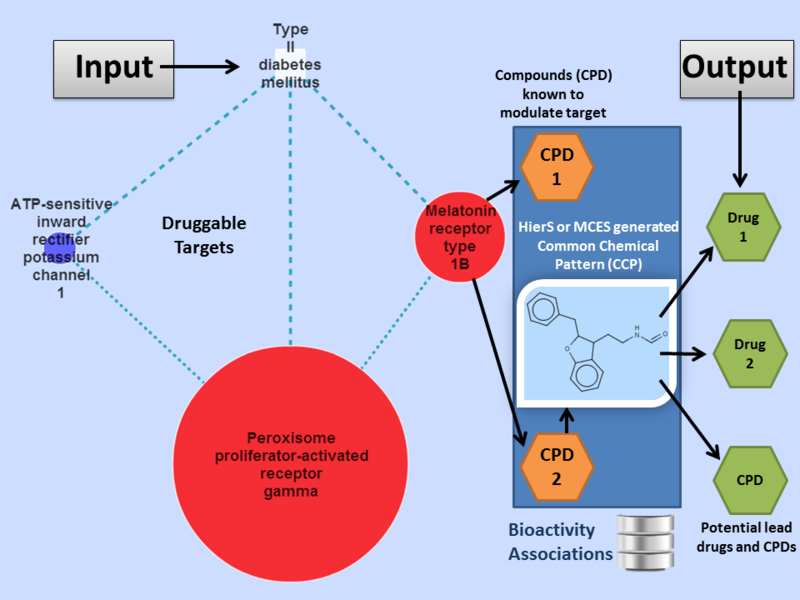 CarlsbadOne is a one-step, bioactivity data-mining,evidence-driven application for biophamaceutical knowledge discovery via cheminformatics, chemogenomics and systems pharmaco-informatics.CARLSBAD = Confederated Annotated Research Libraries for Small molecule BioActivity Data.This web app queries the CARLSBAD database, which consists of targets, small molecules, bioactivities, related data, and chemical patterns comprised of scaffolds and MCES clusters. Disease-query mode: A single disease is the query. Diseases are from KEGG. KEGG also reports linked genes,which reference proteins via NCBI_GI and Uniprot IDs, and thereby CARLSBAD targets.The one-click network includes those targets, active compounds, their CCPs, and neighbor compounds. Drug-query mode: A single drug is the query. All targets for which the drug is active are included in the retrieved subnet. In addition, targets are included for which the active compounds are associated with the drug query via chemical patterns. Target-query mode: A single protein target is the query. All active compounds are included in the retrieved subnet.In addition, compounds are included which are associated with the active compounds via chemical patterns. Empirical – related via empirical activity data. Hypothesis – related via common chemical pattern (CCP) and empirical data. Relationships generally also vary in network distance. However, in CarlsbadOne, to be regarded as empirical, entities must be associated by only ONE link of each type(e.g. target→compound→target). Filters: Minimum scaffold weight: Scaffold-compound associations are weighted based on an approximation of the fraction of compound heavy atoms which are in the scaffold. Lower weights are thus correlated with weaker associations of less significance. Currently, this filter affects both the known active compounds and scaffold-associated unknowns. Targets-only: target-target edges represent shared compounds.Activity profile information is reflected via visual cues (e.g. target-node size). Targets-and-CCPs: compounds are hidden and represented via their CCPs. Target-target edges representing shared compounds included. View a table of targets. View reduced-graph[s] subnet using CytoscapeWeb. View full subnet using CytoscapeWeb. Download XGMML file of reduced-graph[s] subnet. Download XGMML file of full subnet. Download a CSV file of subnet targets and associated data. Download a CSV file of subnet compounds and associated data. * Mathias, S. L. et al. The CARLSBAD Database: A Confederated Database of Chemical Bioactivities. Database-the Journal of Biological Databases and Curation, 8, doi:10.1093/database/bat044 (2013). One webapp UI for query and network viewing via CytoscapeWeb. One step, one topic query logic, with queries defined by one disease, drug, or target. One degree of separation via chemical pattern associations to novel target/compound hypotheses. One unified, coherent data resource. Step One for bioactivity knowledge discovery.